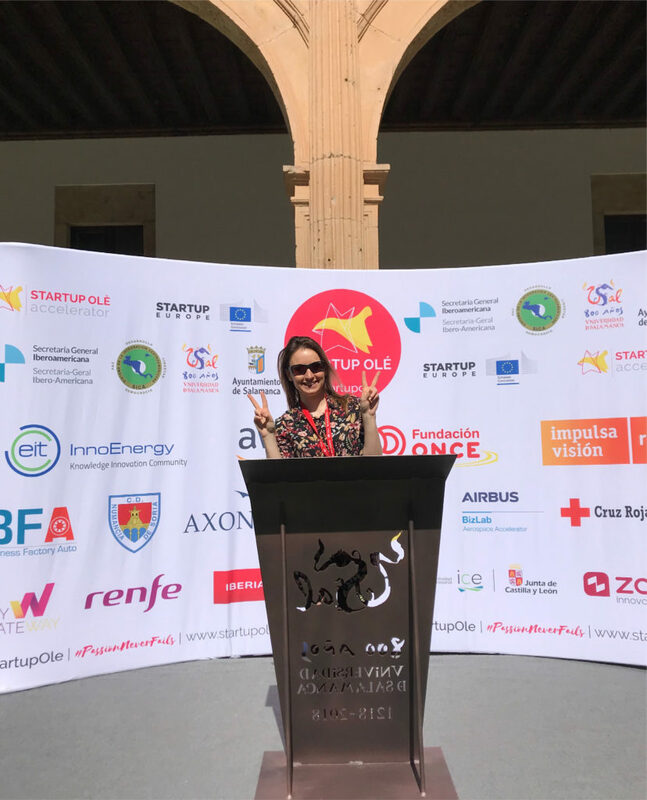 One day in January when I was looking around for some interesting events to join as a speaker and evangelize about company culture, I noticed something interesting may be brewing in Spain. My starting assumption was to try to join local, not yet crowded, but well organized conference so I can expand my network and find some interesting ideas. I hit the Startup Olé website a few times and still hesitated whether I should go or not. This was not an easy decision, as at the time we’ve had a hectic period at Bee Talents, and I wanted to be laser-focused on our Q1 company priorities above all. Finally though – I made the call and bought myself a ticket. I was not about to regret it! To my surprise, despite applying to be a speaker only, I got a Key Player designation! Seeing Bee Talents in the same participant category as AWS, ESA, or Accenture, as well as standing out when 850+ startups were present – were both nice little pride boosters for me. More on that – the organizers put in a lot of effort to enable the attendees to meet before the event itself. Using a clever app called PRESDO the participants and exhibitors were able to contact each other and talk business. I jumped the opportunity, and among others, had some fruitful conversations about using video in recruitment with Petr from e-jobin, a candidate evaluation platform. E-jobin records the answers which are then evaluated by a psychologist, which gives the customer a better look into candidates personality. Petr – I think you’re doing an awesome job and I keep my fingers crossed for you to expand your tool into other countries. I was on the lookout for good ideas to develop our consulting services to become an industry leader locally, and networking sessions provided me with some. With the recent additions of phenomenal Barbara and Aga to our veteran consultant in Zuzia, I think the consulting team will be one of our greatest assets in 2019! In a nutshell, I’ve met Prime Minister of Spain Pedro Sanchez. It was kind of nice experience and it raised the profile of the event. First, the special forces checked the venue with bomb-sniffing dogs, and everything looked dead serious. When it comes to the speech however…I understood nothing, as it was in Spanish. But really, I don’t mind it and I appreciate such a great cooperation between government and startups. Why I’ve never seen such high-profile political presence at a Polish event? Reason no 4. Cooperation between the University and city council. Startup Ole is a terrific example of cooperation between the university and city council, which comes together into a well-designed event. I had zero organizational reservations throughout my stay, and the parties involved really gave it all. The University provided the event with ample and beautiful space, and there were around 300 volunteers who were attending to participants. In the far future, maybe Bee Talents will organize a conference in Poland, and I’m glad that I could learn some about this topic in Salamanca! Reason no 5. Salamanca – queen of the event. 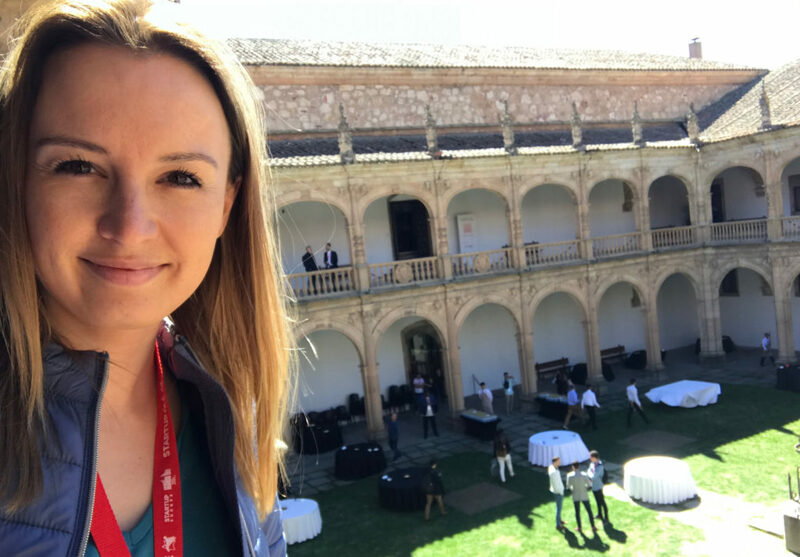 I said above that the conference venue was beautiful – and I’m not sure if that serves justice to the University of Salamanca. University was established in 1218 and is the third oldest university in the world that operates continuously. And even if the old-timey campus did not satisfy your need for aesthetics, the city around it certainly should. The city is very architecturally cohesive, and it is lit with warm rays of Spanish sun most of the year. I read recently that Castille region gets on average twice the energy from the sun per year as Poland does! Similar to our HQ, Poznań, Salamanca is also a booming student city, with around 28k in a city of 150k. Close to Madrid and Lisbon, Salamanca is just an awesome city. I hope to come back here with more time to spare soon! It is said that Spaniards are open and friendly, and this stereotype got conclusively confirmed during this trip. Tip of the hat to Emilio Coronado, the founder of Startup Ole. He gave us a lot of great energy from the stage, and thank you for that. A lot of the events during Ole were in Spanish, which made me wish I spoke this vivacious language. However, during one of the panels, something awesome happened – when the speaker asked the audience if anybody did not speak Spanish, I was the only person to raise my hand. Mere seconds later I was being assisted by a translator-volunteer (Alba, thanks again girl!) who helped me get the most of the discussion. Impressive! That’s basically all. I’m happy to gain some new experiences and share it with you. And you, would you have come to such an event if you were in my place?